“Our society is being subordinated to giant global corporations who are planning the future,” he said. “They are planning our future by mass marketing … making sure (children) are overmedicated at a very early age, shown programs that are violent and addictive. … When are we going to put it all together and say this world has to be subjected to the sovereignty of living people, not the sovereignty of corporations?” Silver, Miriam. “Nader Preaches to Converted at Health and Harmony Fair”, The Press Democrat, 2000-06-11, B1. “For more than 20 years, Democrats have talked about universal health care. In 1993, Democrats controlled both chambers in Congress” and voters had elected “a president who actually had the courage to propose a plan for universal health care. It was completely killed” by lobbyists for insurance companies and the health care industry. … “You don’t have to take my word for it,” he said. “You can ask the person who was in charge.” That would be Clinton, her party’s presidential front-runner. cosbo. 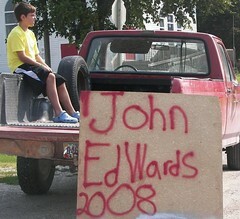 “Edwards: Bringin’ it & Obama: Swingin’ it”, Daily Kos, 2007-09-09. The choice we must make is as important as it is clear. It is a choice between looking back and looking forward. A choice between the way we’ve always done it and the way we could do it if we dared. A choice between corporate power and the power of democracy. Between a corrupt and corroded system and a government that works for us again. It is caution versus courage. Old versus new. Calculation versus principle. It is the establishment elites versus the American people. It is a choice between the failed compromises of the past and the bright possibilities of our future. Between resigning ourselves to Two Americas or fighting for the One America we all believe in. Submitted by patald on Wed, 09/12/2007 - 11:39. I was there, too. I still wonder who was behind the “vote for Nader and you give a vote to Bush” drivel. I don’t think a vote should be driven by anything but your political views. If this was why Gore won, and I don’t think it was, then there is definitely something wrong with our system. Perhaps we should dispense with the Electoral College.